He runs, he shoots, he scores! The new NetEnt slot release – Football Champions Cup mobile slot – brings the thrill and excitement of football. While everyone's eyes this summer will be on the European Football Championship, we only have eyes for new mobile slots, so we took the chance and reviewed Football Champions Cup game. In this review, you'll find all the information on the theme, gameplay and features of this slot and find out if it'd be a good match for you. Sport themed mobile slots aren't really our thing. It's not because we don't like sports, but because developers mostly miss the mark in creating a game that captures the high level of activity and the intense action that are an essential part of sports. Well, that's not the case with Football Champions Cup mobile slot by NetEnt, which ticks all the right boxes. Even if it's not the best looking game graphically that NetEnt have released, it still echoes that spirit of the upcoming European Football Championship 2016 and has got features that are extremely engaging and will get your adrenaline going. And that's because there are plenty of giant multipliers to be won. From a mere 16x multiplier that you can claim in the bonus game all the way up to 500x your wager, there's scope for massive wins! You can definitely see that NetEnt haven't put as much effort and time into designing slot – it's far from picture-perfect. When you think about recent hot releases such as Aloha Cluster Pays and Guns N Roses, then Football Champions Cup definitely struggles. The symbols look plain and quite IGT'esque in that they could be called ‘classic' as opposed to ‘contemporary.' Plain letters mostly populate the reels, as do referee whistles, gloves, plaques and a golden cup too – that's the best NetEnt decided to do in terms of gameplay graphics here. The backdrop of a massive football stadium is nice, but the faint roar of the crowd sounds more like there's an issue with your computer's ventilation. We even had to check if it was our laptop or the game gently buzzing. Nonetheless, the lack of attention to detail was perhaps warranted given the fact that NetEnt have had some stunning new releases recently. The developers probably just wanted to put out a slot – even a slot that looks mediocre – before the Euro 2016 in France this June and July, and they've accomplished that much. Oh and in line with the theme, you'll even get to pick a team that's part of the actual Championship and take them through the bonus spins, more on which in the features section. Of course, having decent graphics and an engaging theme is all good and fun, but what about the scope for large wins? We've got good news and not such good news. The bad news (or good news, depending on your playing style) is that this is a medium volatility slot, which means that the wins don't come at you thick and fast. Quite the contrary. Patience will be rewarded by the Football Champions Cup slot, which carries an extremely high RTP of 96.82%. This means that although you have to stick around and wager through the rough, dry patches, when the wins do come, they're at least moderately sized. Or huge ones, even! You can bet from just 20p per spin all the way to £100 – a standard range for NetEnt slots – which brings the total maximum win that you can get in the base game to £105,100. Needless to say, the wins are much more substantial when you go through one of the features. While the base game falls a little flat in terms of wins, the features compensate for it handsomely. You've got Wilds, Overlay Wilds, a Bonus Game and plenty of Extra Spins with the biggest wins too. All in all, this mobile slot is pretty well-rounded. 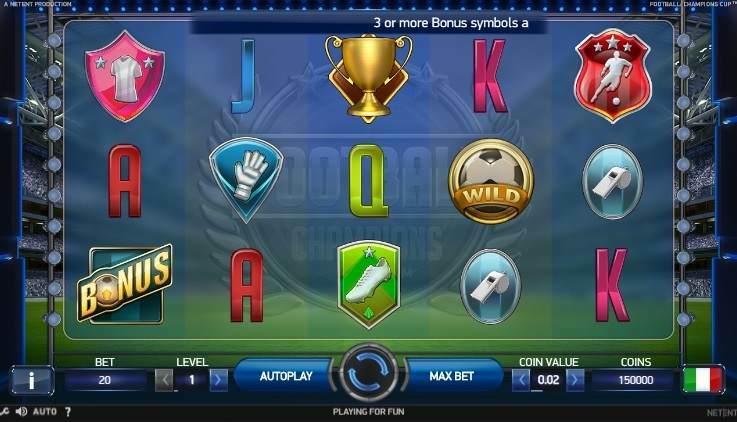 Wilds are wilds on any mobile slot: they will substitute for any other symbol on the reels, with the exception of the Golden Cup and the Bonus symbols. Meanwhile, collecting five wilds on an active payline will get you a 2,000 win, four wilds will get you a 200 win and three simple wilds will get you 50. And then there are the special overlay wild substitutions, which are slightly more complex, but more rewarding too. It can happen half-way through your spin, so keep a keen eye on the reels and you might get two, three, four or even five footballs jump across the screen and become wilds. Of course, just two or three won't make a huge difference to your total win, but when you're talking about four or five on an active payline, then you'll really see your wins climb into the hundreds and thousands, depending on your wager. Alright, alright. It's a little bit like the actual Euros, but instead of fame and glory for your country, you're able to reap massive wins from the extra spins on Football Champions Cup. Actually, before we start chatting about the extra spins on this slot, we have to say that they remind us of the extra spins feature on Drive: Multiplier Mayhem, another recent NetEnt release. Including the dark colour scheme of neon blues, greys and blacks, the extra spins are played in levels. Depending on which team you chose to play with at the introductory screen when the mobile slot loaded, you'll take that team through to the extra spins mode. By the way, three Golden Cup symbols will get you there. There are a total number of four rounds to get through, which imitates the knock-out stage of an actual football championship. It's quite simple to advance: six extra spins are taken in each stage and you're playing against the opposing team; Scoring Wilds in blue will appear on reels one and two that will award you a ‘goal', whereas red Scoring Wilds will appear on reels four and five and will award your opponent goals. The team with the most ‘goals' wins the round and the other team is eliminated. Your objective is to win four games in a row to then claim the top championship prize of 500x your bet. Coming in second will get you a multiplier of 100x and third will get you a nice 20x multiplier. And even if you don't win a place in one of the top three spots, you'll get to keep whatever you won from the extra spins themselves. Simple. But Wait – There Is A Bonus Game Too! As if the extensive extra spins round and the two types of wilds weren't enough, there is also a bonus game on Football Champions Cup mobile slot. That's triggered by at least three bonus symbols, but can also be triggered by four or five of them. Depending on how many bonus symbols you get, your random multipliers will change: three will get you anywhere from 1x to 12x multiplier, four will get you between 3x and 14x and five will get you between 5x and 16x. Each Penalty Shootout bonus game consists of five rounds with two parts to it each. That's 10 clicks in total that you must make, choosing randomly out of four positions in the goal post. First, you'll pick a position in the net where you want to try and score and second, you'll become the goalkeeper and pick one position to save from the opposing team. So, if you make the shot, your score will increase by one point and a cash prize will be awarded. Meanwhile, if you save the shot of your opponent, a multiplier is awarded. If you miss and the opposing team scores, then their score will increase by a point. The more goals you get, the higher the multiplier you get awarded. If the game is tied when the five rounds are up, then an addition game will be played as the tie-breaker. Want to play Football: Champions Cup? The football star in you will love the feature packed Football: Champions Cup slot! Football Champions Cup The theme of this slot is quite predictable, but for the football fanatics that walk among us, it will be exactly what the doctor ordered. Featuring five reels and 20 paylines, with a maximum win of 1,051 times your bet, this slot's features is where the maximum wins lie. It's not quite at five-star level in terms of graphics and audio, but if there is a Euro 2016 game that's a bit boring or you're stumped as to what you could do at half-time, then Football Champions Cup mobile slot by NetEnt could be the answer you're looking for. And don't forget that Leo Vegas Casino offer one of the largest welcome bonus packages around: if you're a new player, you'll get £1,500 in deposit bonuses and 250 extra spins too! Perfect occasion to check out their extensive games portfolio, including Football Champions Cup.